Rural Health Insurance and Competitive Markets: Not Always Compatible? What Explains the Growing Metro/Nonmetro Gap in Employment Based Health Insurance? Farmer Health Insurance Cooperatives: An Innovative Solution for Other Americans? Access to health care involves adequate availability of medical professionals and related services and the ability to afford those services, through health insurance plans and/or to cover out-of-pocket expenses. Measuring adequacy of care available and the ability of the farm population to pay for care for the 5.5 million persons in family farm households is confounded by a variety of factors that point to the uniquenesses and differences among farm families, as well as the limitations of current data systems. Regarding the adequacy of care, health status of farm people, riskiness of the farming environment, and the physical distances to health professional services and facilities all come into play. 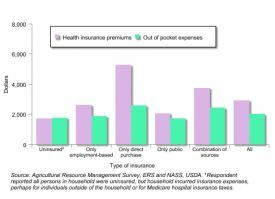 Besides household income, the ability to pay for care is largely influenced by access to reasonably priced insurance plans, such as employer-sponsored plans. Health care reform promises to directly address the issue of access to affordable health insurance coverage that here-to-fore has not been widely available to self-employed individuals and their households. However, it is much less clear how health care reform will affect the location of health professionals and facilities in rural areas where farm households are more likely to reside. Unlike for the general population or the rural population, objective and comprehensive information on the mortality and health status of the relatively small farm population is not available. Therefore, there is no simple summary conclusion to draw about the health status of the farm population, as is possible when discussing health status of the rural population. Partial information on health outcomes of farmers is available from small area epidemiological studies that are not representative of all farmers (e.g., cancer effects of alternative pesticides on high-risk farmer groups). Nationally comprehensive, yet partial, indications of the health status and mortality of farmers are available through occupational fatalities data and self-reported health status of farm operators whose principal occupation is farming—less than half of all principal farm operators. Information is also available on factors that contribute to health outcomes of farm operators with a major occupation of farming, such as personal behavior (e.g., smoking and diet). But, it is clear that farming has had and continues to have more fatal on-the-job injuries than most other occupations. While the overall occupational fatality rate of workers in the United States in 2008 was 3.6 per 100,000 workers, the rate for those with farming or ranching as a major occupation was more than ten times higher—39.5 per 100,000 (U.S. Department of Labor, 2009). Furthermore, whereas fatal injuries per 100,000 workers generally declined for all U.S. workers from 1992 to 2008, the fatality rate for farmers and ranchers almost doubled during this same period. Leading causes of farm fatalities from workplace injuries and accidents are transportation incidents including tractor rollovers, contact with objects or equipment, and assaults including animal attacks. More than 100 farmers in the United States die annually from tractor overturns. Contributing to the risks are the long hours worked during planting and harvesting periods by farmers, their family members, and hired workers. The fatal injury rate for those in crop production has averaged more than twice that for those in animal production. While these national data are for farm operators, we also know that they have implications for others who live on U.S. farms since farming is one of the few industries in which the families—who often share the work and live on the premises—are also at risk for injuries, illness, and death. In the Keokuk County, Iowa Health Study, youth reported the average age for driving tractors of 11, for driving self-propelled combines of age 13, and for applying or handling fertilizer of age 12. This occurs, despite the legal prohibition of hazardous work for children under the age of 16 (Park, et al. 2003). In contrast to higher farmer fatality rates, a recent ERS report found generally favorable health-related personal behaviors and disease incidence self-reported by individuals with farming as their major occupation in a national survey. In particular, the incidence of farmer smoking was significantly less than that of other workers (Jones, et al. 2009). The incidence of cancer, asthma, and emphysema are often the focus of epidemiological studies of small farmer groups because some farming practices, such as the use of farm chemicals, are often hypothesized to result in negative health outcomes. And, yet, this study reported that relative to nonfarm workers, farmers reported significantly lower—not higher—incidence rates of asthma and emphysema and no difference in the incidence of cancer. Seemingly confounding results are reported elsewhere in the literature for asthma. For example, a small Iowa population study found farm children were less likely to have asthma than other children in the county, unless they were living on farms that raised hogs and added antibiotics to feed (Merchant, et al. 2005). On the other hand, a study of dairy farmers in New York showed that farmers have an elevated risk for asthma (Jenkins, et al. 2005). The Iowa study also found that men had lower rates of asthma than women, even though the men were more likely to be farming and have greater exposure to hazardous conditions, such as grain dust and agricultural chemicals (Merchant, et al. 2002). In a national sample, farmers reported significantly lower incidence rates of cardiovascular diseases than nonfarmers, perhaps as a result of their physically active lifestyle (Jones, et al. 2009). This is consistent with a study of New York dairy farmers for 1999 which found that farming had a protective effect for hypertension and other cardiac conditions (Jenkins, et al. 2005). The need for health care and health status can be mediated by higher socioeconomic status. Farm operator households are more likely to be of higher socioeconomic status than all nonmetro households: a larger share has household heads that graduated from college and median household income and wealth are higher. But the need for care also generally increases with age and farm persons have an older age profile than the general U.S. population. In short, what partial information is available on the health status—and, hence, health care needs—of the farm population simply does not lend itself to a clear conclusion about how the farm population compares to the general U.S. population. Convenient access to health care is more likely to be a challenge for persons residing in sparsely populated areas, whether farm or nonfarm, as a result of the greater distances to doctors’ offices and major medical facilities. The geographical distribution of the households of farm principal operators is quite different from that of all U.S. households, which are predominantly located in metro counties (83%), with one-third in principal cities of metro countries. In contrast, farm operator households are predominantly (60%) located in rural areas, and among rural households, farm households are more likely to be in the lower density, more remote rural areas. Farm households located in metro areas are concentrated in smaller metro areas while nonfarm households are more likely to be in large metro areas. Compared to the general U.S. population, farm operator households generally have to travel greater distances to receive health care, especially specialized care. Based on the Department of Health and Human Services’ Health Professional Shortage Areas, as shown in Figure 1, 17% of the farm population resides in shortage areas for primary care access, compared to less than 4% of the U.S. population (Jones, et al. 2009). Farmers are more likely to reside in shortage areas for dental and mental health care, too, than the general population. Nearly half of all farmers reside in areas designated as mental health shortage areas. There are 2.1 million farms in the United States. 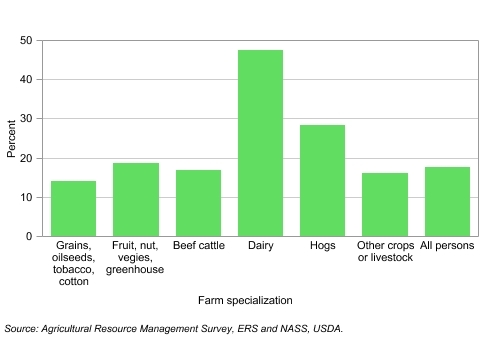 Most of these farms, 97%, are classified as family farms operated by a self-employed farmer. Obtaining health insurance coverage can be a challenge for self-employed persons, farm or nonfarm, since the major source of health insurance in the United States remains employer-sponsored insurance. In 2008, 75% of insured persons under 65 years of age in 2008 were enrolled in employer-sponsored insurance programs (Denavas-Walt, Proctor, and Smith, 2009). Government insurance plans are available to those 65 or older and those with specialized needs, such as the disabled or those with very low income. Otherwise, those without access to employer-sponsored insurance plans must rely on individual health insurance plans. The terms and expense of health insurance plans vary widely, but generally individual plans have higher premiums and greater out-of-pocket expenses due to greater exclusions, deductibles, and co-pays. Data on health insurance coverage of the U.S. population has been available for decades. However, because of their small numbers, data on persons in farm operator households have only been available since 2006 on USDA’s Agricultural Resource Management Survey. For the most current year available, 2008, 15.4% of the U.S. population had no form of health insurance; for members of farm operator households, the comparable figure was 17.7% (U.S. Department of Agriculture, 2009). But in the prior two years, persons on farm households were more likely than the general public to have health insurance. The higher rate of decline in insurance coverage for farm persons from 2007-08, compared to the U.S. population, points to their greater vulnerability to being uninsured. In some cases, farm households lost employer-sponsored health insurance along with off-farm job opportunities, and in other cases, farm households were less able to purchase the more expensive individual plans directly from an insurance company as their household incomes declined. 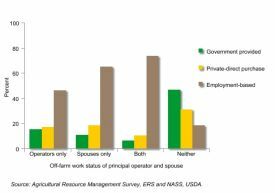 Although farm operators are largely self-employed, the majority of farm households have an operator or spouse employed off the farm. Consequently, as with the general population, the most common source of health insurance for members of farm households is employment-based. In fact, farmers are almost as likely as the general U.S. population to receive their health insurance through an outside employer. Farmers are more likely than the general population to directly purchase their health insurance from an insurance company, and less likely to receive health insurance from a government-sponsored program, such as Medicare or Medicaid. In 2008, about half of farm household members had health insurance coverage from an employment-based plan. For households where both the principal operator and spouse worked off-farm, nearly three-quarters of household members were covered by employment-based plans. In households where neither the principal operator nor the spouse worked at an off-farm job or business, only 18.6% of household members were covered by employment-based plans. Members in these households had significantly more coverage under private-direct purchase plans and government-provided plans, such as Medicare. 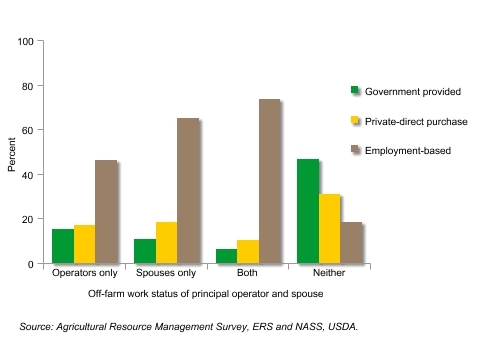 The reliance on government plans for those who do not work off the farm is consistent with the higher share of these operators who reported being 65 years old or more. One major reason that a farmer or rancher would work solely on the farm and not have access to employer-sponsored insurance through an off-farm job is the intensive time commitment for some commodity specializations. An obvious example of this is in dairy production. 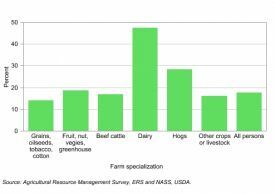 Farming is the major occupation for 95% of those that specialize in dairy production—significantly more than the 43% across specialties. Compared to the 60% of all farm persons who receive insurance from employer-sponsored plans, only 30% of persons in dairy households do. In 2008, 47.5% of persons in dairy households did not have any health insurance coverage. In 2007, the comparable share was 34.7%. This increase is reflective of the deteriorating financial conditions for dairy producers from 2007 to 2008 when average dairy family farm income from farming declined by 6.2%, with further declines expected for 2009. 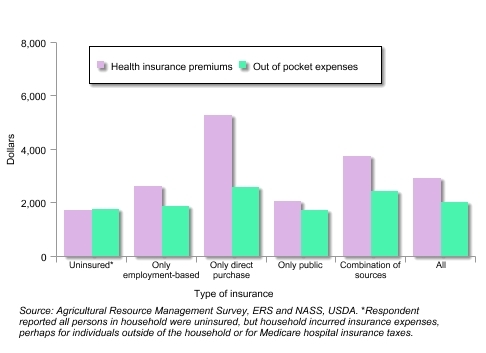 Having health insurance and the source of health insurance are major determinants of the household expenses for health care. More than 10% of farm households had only direct-purchase insurance in 2008, the most expensive type of plan on average. These farm households had the highest health expenses of all farm households, nearly $8,000 per household and accounting for one-fifth of their total household cash expenses in 2008. Although comprehensive information does not exist on health status of farm persons, that is not the case for information on their access to health care. As often self-employed and residents of remote rural areas, most farmers currently face a double challenge in obtaining access to care. We can say with relative certainty that farm operator households have less access to care as measured, first, by availability of local medical resources. Secondly, they have less access due to their higher health care expenditures for insurance premiums and out-of-pocket expenses, although they also have greater average incomes. Current versions of the health care reform bills that extend insurance coverage to individuals that are not currently offered group plans through employers could increase access of farm households to insurance coverage. In addition, given the known risks of their farm occupation, farmers who currently face obstacles in obtaining coverage as insurance companies seek to minimize their exposure to enrollees in high-risk occupations are likely to have those obstacles removed. Although specific plan benefits are not clearly defined under the reform bills, plans available through an insurance exchange could include plans that offer co-pays and deductibles that are much lower than those currently offered by the current individual plans. Due to low population densities and small patient volumes in rural areas, geographical access to care—particularly for farm households living in smaller and more remote counties—will likely continue to be a challenge after the next round of health care reform. Rural areas are already experiencing less access to physicians, for both primary care and specialists. Provisions that provide incentives for medical personnel to locate in underserved areas, for example, medical school loan forgiveness programs, will aid in improving access to care. However, there is a great deal of uncertainty about how providers and insurance companies will adjust to the incentives provided by changes incorporated in new legislation. 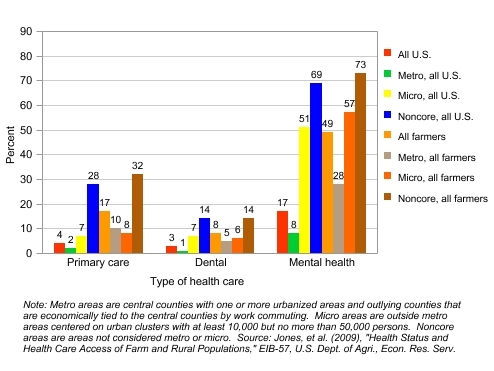 Of special concern will be adjustments that come in the form of movement of health care resources away from rural areas as discussed in other articles in this issue, if providers recognize greater incentives to locate in metro areas. Denavas-Walt, C., Proctor, B., and Smith, J. (2009). Income, poverty and health insurance coverage in the US: 2008. Washington, D.C.: U.S. Dept. of Commerce. Bureau of the Census. P60-236 (Rv). Jenkins, P., Earle-Richardson, G., Bell, E., May, J., Green, A. (2005). Chronic disease risk in Central New York dairy farmers: results from a large health survey 1989-1999. American Journal of Industrial Medicine 47 (1), pp. 20-26. Jones, C., Parker, T., Ahearn, M., Mishra, A., and Variyam, J. (2009) Health status and healthcare access of farm and rural populations, EIB-57. Washington, D.C.: U.S. Department of Agriculture, Economic Research Service. Merchant, J., Naleway, A., Svendsen, E., Stromquist, A., Kelly, K., Taylor, C., Thorne, P., Reynolds, S., Burmeister, L., Sanderson, W., Chrischilles, E. (2005). Asthma and farm exposures in a cohort of rural Iowa children. Environmental Health Perspectives 113 (3), pp. 350-356. Merchant, J., Stromquist, A., Kelly, K., Zwerling, C., Reynolds, S., and Burmeister, L. (2002). Chronic disease and injury in an agricultural county: the Keokuk County Rural Health Cohort Study. The Journal of Rural Health, 18 (4), pp. 521-535. Park, H., Reynolds, S., Kelly, K., Stromquist, A. Burmeister, L., Zwerling, C. and Merchant, J. (2003). Characterization of agricultural tasks performed by youth in the Keokuk County Rural Health Study. Applied Occupational and Environmental Hygiene, 18(6), pp. 418-429. U.S. Department of Labor, Bureau of Labor Statistics. (2009). National census of fatal occupational injuries. Available online: http://www.bls.gov/iif/oshcfoi1.htm/. Mary Ahearn (mahearn@ers.usda.gov) is a Senior Economist, Economic Research Service, USDA and Ashok Mishra (amishra@agcenter.lsu.edu) is an Associate Professor, Department of Agricultural Economics and Agribusiness, Louisiana State University AgCenter. The views expressed in this article are the views of the authors and not necessarily the views of the institutions of the authors.